This puzzle is called Bolygok, which means Planets in Hungarian. It consists of a solid cube-shaped frame in which is embedded at each corner a ball. These 8 balls can be rotated individually. The balls have 6 coloured dots, so that when they are aligned each of the six faces of the cube will show 4 coloured dots (one on each ball). The dots on the balls come in four colours - yellow, blue, red and green. Every ball has one or two dots of each colour. There are several possible objectives for the puzzle which will be detailed below, but two obvious ones are: Get the four dots of each cube face to be the same colour, or get the dots on each face to be all different. This puzzle was invented and patented by Jozsef Bognar, and patented in Hungary 26 August 1980, HU 1347. It also has an equivalent British patent GB 2,076,663, granted 9 December 1981. Note that the patent also covers the variation of Instant Insanity pictured on that page. Below is the arrangement of colours on the balls. Four colours on a face. Two colours on a face, coloured as two adjacent pairs. Two colours on a face, coloured like a checkerboard (i.e. diagonal pairs). Two colours on a face, three of one colour, one of another colour. One colour on a face, i.e. all the same colour. One colour is not visible. Each face uses only combinations of yellow and red or of blue and green. There are 8 balls, each of which can be placed in 24 possible orientations. This gives 248 = 110,075,314,176 positions. Not all these orientations are outwardly different however, as 4 of the balls actually can only show 21 different colour combinations. Thus 244214 = 64,524,128,256 distinguishable positions remain. All solutions are shown in the orientation shown above, i.e. the Upper Front Left ball is the one with red dots on opposite sides, and the Bottom Front Left has opposing green dots. Click on a number below to go directly to the appropriate section. I did a computer search for solutions with all 4 colours on each face, and there are 59418 solutions. If you insist that each ball shows 3 different colours as well then there are only 3236 solutions left. Of these, 12 solutions have central symmetry, and these are shown below. Again the puzzle is assumed to be in the orientation shown above (i.e. the Upper Front Left ball has its red dots on opposite sides, and the Bottom Front Left has opposing green dots). There are 3 solutions in which each face shows the 4 colours in the same order. My computer search for solutions with each face half one colour and half another, showed there are 26174 solutions, all but 1848 cases have some balls which show the same colour twice. There are 124 solutions with opposite faces identical. Only 9 of these cases have no balls with duplicate colours, and these are shown below. 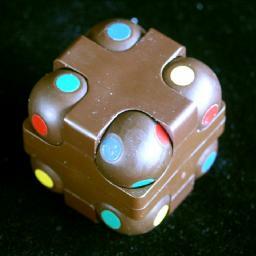 There are 102 solutions with only three colours (no blue), all of which have one or more balls with duplicate colours. The two solutions that also have opposite faces the same are shown below. There are 32 solutions that use red/yellow and blue/green combinations. Only 4 of them have no balls with duplicate colours, and these are shown below. My computer search for checkerboard solutions showed there are 1035 solutions, all but 66 cases have some balls which show the same colour twice. There are 16 checkerboard solutions with opposite faces identical. All are shown below. The last 4 cases have balls with duplicate colours. There are 6 checkerboard solutions which use just three colours. Note that the missing colour must be blue, since each of the other colours occurs on opposite sides of a ball and hence must be visible. There are just 3 checkerboard solutions which use only green/blue and red/yellow combinations. My computer search for "3+1" solutions showed there are 2,664,606 of them, but there are 125,748 solutions in which each ball shows three distinct colours. There are 4,236 solutions with opposite faces identical, of which only 456 solutions are such that each ball shows three distinct colours. One of these is shown below. There are 18,530 solutions without the colour blue, all of which have one or more balls that show only two colours. Of these, 154 also have opposite faces identical, i.e. are also solutions to 4b. One of these is shown below. Each face uses only combinations of yellow and red or of blue and green. There are 2048 solutions, of which 256 have no balls showing duplicate colours. One of these is shown below. There is no position that solves both 4b and 4d simultaneously. There are two positions where each face has a single colour.